WhatsApp in an instant messaging app which enables you to send or receive any text, audio, video to each other. During receiving any messages on any group you will get a notification which interrupt you lot of time. Today we discuss an important and interesting tips how to mute group chat notification on WhatsApp. Around the world there are billion of users who love to use WhatsApp on his smartphone. Lot of person spend his most of the time during sending or receiving messages to each other either to single person or in a group. WhatsApp in an important app which enables you to quickly send or receive messages, audio,video and other thing. You can also get the benefit of WhatsApp voice calling feature. With the help of WhatsApp video calling feature you will be able to easily start WhatsApp calling without paying any extra charge. You can easily enable and use WhatsApp voice calling feature on your Android, iOS or any other smartphone. Lot of time you will be disturb during receiving any chat notification on your WhatsApp. If you don’t want to hear any WhatsApp chat notification then you have to take following easy steps to mute group chat notification on WhatsApp. Step 1: If you will be a member of any group on WhatsApp and want to mute group chat notification on WhatsApp then turn on WhatsApp on your phone. Step 2: Tap on the “Chats” option in your active WhatsApp window. Step 3: Tap on the group which chat notification you want to mute as per your requirement. Step 4: Tap on the options or three dot button which is placed on the top right corner of active WhatsApp group window. Step 5: Tap on the “Mute” option. Now you will get different time interval options, in which you have to select specific period to mute chat notification WhatsApp group. If you don’t want to see any chat notification of active group then you have to unchecked the “Show notification” option. Step 1: Tap on the “Chats” option in your active WhatsApp window. Step 2: Tap on the WhatsApp group from you want to remove mute chat notification. Step 3: Tap on the option or three dot icon which is located on the top right corner of your active WhatsApp group window. Step 4: Finally, tap on the “Unmute” option. Now, you will be able to hear sound during receiving any chat notification on active WhatsApp group. 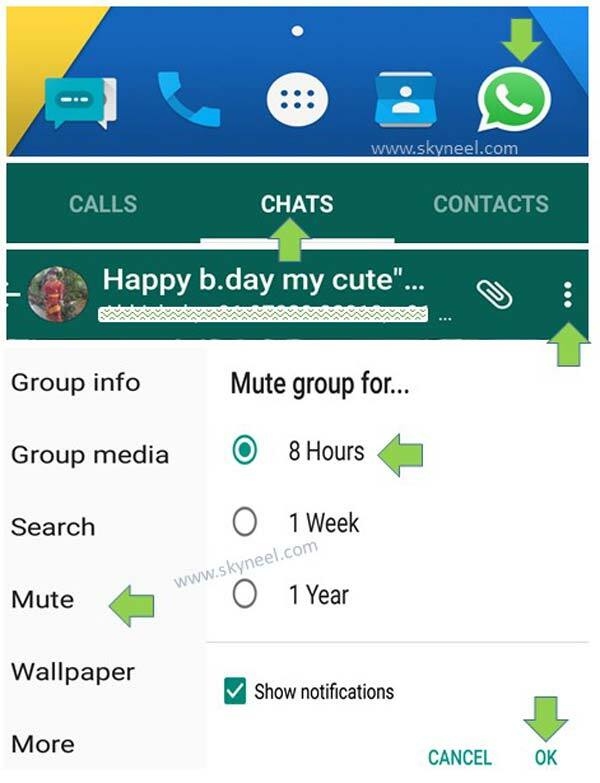 Now after following all these easy steps you will be able to easily mute group chat notification on WhatsApp. If you have any suggestions regarding this article then write us in the comment box. Thanks to all.